OXFORD, Miss. 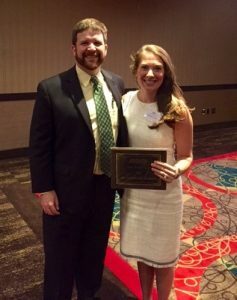 – A research program and two faculty members of the University of Mississippi’s School of Pharmacy were honored at this year’s meeting of the Mississippi Society of Health-System Pharmacists in late July. 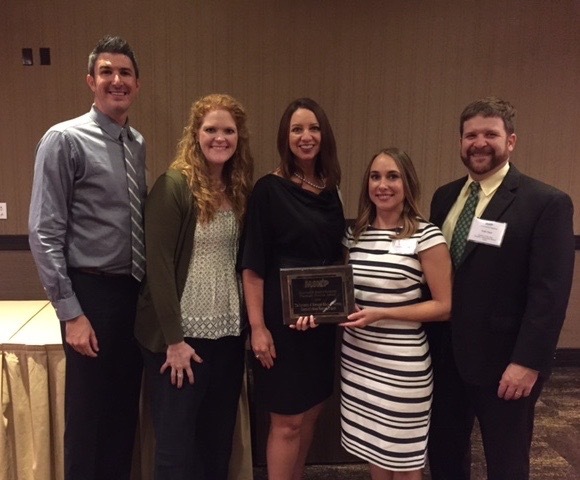 Left to right: Josh Fleming, Laurie Fleming, Leigh Ann Ross and Courtney Davis accept MSHP awards on behalf of the University of Mississippi School of Pharmacy, presented by Todd Dear. The Innovative Health-Systems Pharmacy Practice Award went to the School of Pharmacy’s Community-Based Research Program, which provides counsel to underserved areas of the state, especially in the Delta. Established in 2008, the program partners with state health projects, including the Delta Pharmacy Patient Care Management Project and Transitions of Care, to improve patients’ transition from hospital to home by assisting them with medication adherence. This program also received the 2011-12 American Association of Colleges of Pharmacy Lawrence C. Weaver Transformative Community Service Award. MSHP’s most prestigious award, the Health-System Pharmacist of the Year Award, went to Joshua Fleming, clinical assistant professor of pharmacy practice, for service to the community and profession, as well as contributions to the progress of his health care team. Anastasia Jenkins won the 2016 MSHP service award, presented by Todd Dear (left). Anastasia Jenkins, clinical assistant professor of pharmacy practice, received the MSHP service award for her work in increasing student involvement in the organization. She has served in many capacities for MSHP, including as treasurer. Courtney Davis, clinical assistant professor of pharmacy, was also installed as president of MSHP.